After 4 weeks or so of practise in the passage at the side of Clive's house he decided that the time had come to launch himself into orbit on the unicycle. I ran along side him steadying him till he reckoned he'd built up enough speed to continue on his own and with the grace of a demented turkey trying to escape the butcher at Christmas he was off, well he was soon OFF, but not before he'd done about 15 yards. C'mon, the Wright Brothers didn't do much more the first time! This is the end of the Castlelaw climb from the south side. It's definitely longer than the climb from the north but at least the surface is rideable. Tonight we set off at about 5.30 pm and did the Castlelaw climb first, then along to the rough track round Black Hill to meet the track that comes up from Flotterstone. We then doubled back up to the top of the track to Balerno, rode part of the way down to then cut along to Harelaw reservoir, from there it was back up the track over to Glencorse reservoir, down to Flotterstone, up the road and turned left to descend through Mauricewood down to Auchindinnie. From there it was back along the railway track towards Rosewell with the added challenge of what I call Dougie's Double Challenge, a rough little section of track and a couple of tricky roots to get over, one going uphill and the other within five yards going downhill. For the first time I managed to clean them both tonight, I usually get the handlebars caught in the fence that runs alongside them. My total mileage for the day which included a cycle ride in the afternoon (which was a bit easier) was 48.5 miles, most of which was offroad. Trying to conquer the Castlelaw killer climb! Baz and I set off at 5 am this morning in a fine drizzle to give him his first attempt at the Castlelaw climb, a track that's been severely rutted through the winter and one that just gets steeper and steeper. Keeping out of the ruts which are in places 3 feet deep is one thing, keeping the front wheel on the ground is another and needless to say we failed miserably to do it in one go without dismounting. We meandered about on various tracks I had been shown last week, one of the best being the final bit of track round Black Hill, you don't want to suffer from vertigo on that bit! We finished at 9.30 am with 34 miles under our belts and also just as the rain came on heavier. We reached Glasgow and survived (only joking if you come from Glasgow). We set off from Auchinstarry (I love that name!) at 11 am with Glasgow as our aim today. Before long we'd reached Kirkintilloch and passed by the side of numerous other villages I'd never heard of before. The weather was bright and dry with a slight headwind, perfect for the return journey. 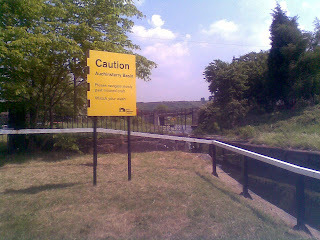 Soon we reached Bishopbriggs and a short distance later what I took to be the outskirts of Glasgow. (Numerous high rise flats etc.). Apart from a couple of guys partaking of a few cans of beer under a bridge, doubtless a hair of the dog cure from last nights excesses, everybody seemed reasonably civilised!! The round trip back to Auchinstarry was 24 miles with the other half beginning to complain that her bum was becoming painful! A meal in the restaurant there celebrated(?) our wedding anniversary (and cost a small fortune). There's something very relaxing about watching a barge pootle along a canal. The outskirts of Glasgow.......high rise flats and power cables everywhere! There's a first time for everything I suppose and today was the first time I've come home with my ankles suffering from sunburn. My better half and I drove to the Falkirk Wheel, parked the car there and set off on the bikes along the Forth and Clyde Canal towpath westwards. It was as we Scots say "stoatting weather" or as any other country that gets warmish temperatures would describe the day as "reasonably pleasant"! I covered most susceptible parts of my anatomy against the sun but forgot my ankles which are still stinging at this moment. 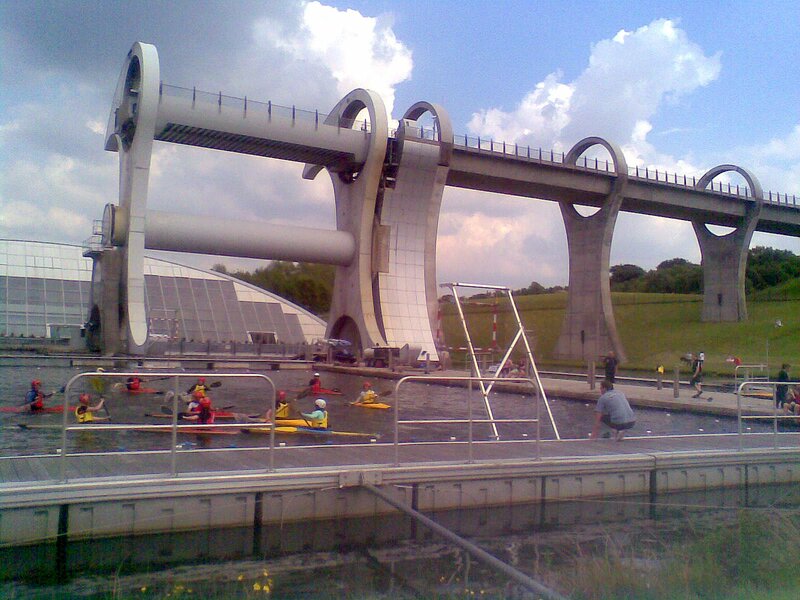 We went as far as Kirkintilloch before we turned and when we did get back there was canoe water polo matches being played in the lee of the Falkirk Wheel, another first as I've never seen this game being played before. I suppose with the amount of rain we get in Scotland this could become a game we could excel at! The quaintly named Auchinstarry Basin. 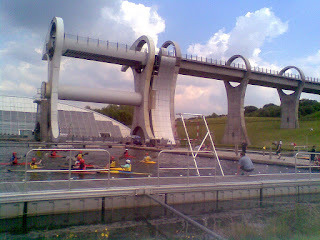 Canoe water polo with the Falkirk Wheel as a backdrop! Is Clive holding on to the fence? We'll never really know but it looks impressive! Oops not quite so impressive now!